A gas leak led to the evacuations of nearby buildings Thursday in the Fenway neighborhood of Boston. 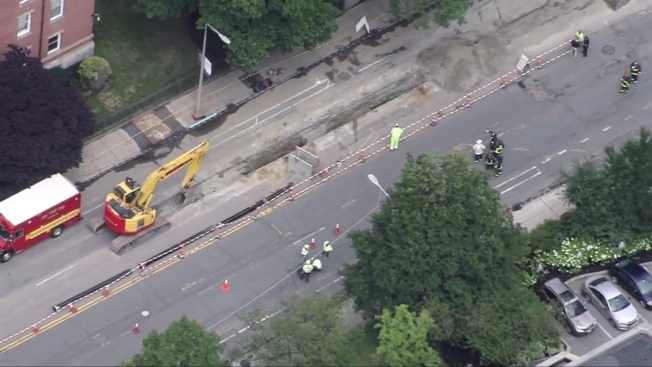 A major gas leak occurred Thursday morning when a construction crew hit a gas line in Boston, prompting the evacuation of several surrounding buildings and impacting traffic in the city's Fenway neighborhood. Officials received a report about a gas leak around 11:40 a.m. and responded to the scene near Brookline Avenue and Pilgrim Road, according to Boston police. National Grid was also notified, and fire officials said the utility responded to the scene to shut down the gas main. Crews from the Boston Fire Department helped to evacuate some surrounding buildings as a precautionary measure. Emmanuel College officials said three of their residence halls on Brookline Avenue were temporarily evacuated as a precaution. They reopened around 2 p.m.
A spokesperson from Beth Israel said the gas leak happened near the hospital's east campus, and that while there were traffic impacts in the area, there were no safety risks that required evacuation and "hospital operations are proceeding as normal." All patients, visitors and staff were safe to be in all buildings and patient care was able to continue as usual. Traffic was also impacted in the immediate area, as police shut down Brookline Avenue from Longwood to the Riverway.